The Enviro E Series is an inline unit that incorporates multiple processes and chambers within one prefabricated enclosure. Our units are available to suit pipe sizes ranging from 225 to 1050 mm. 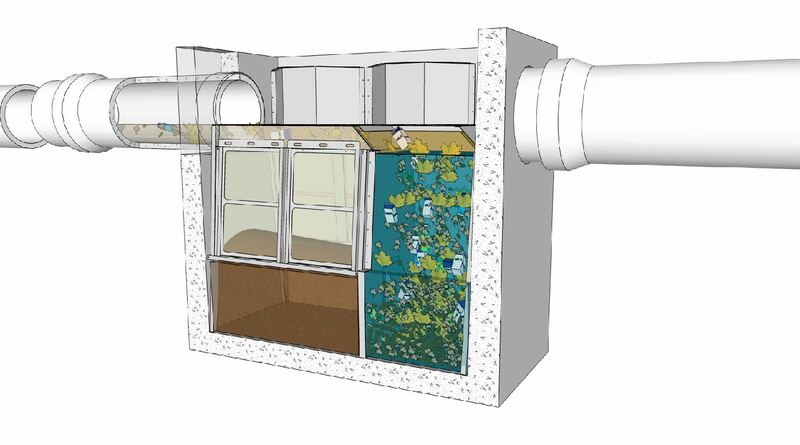 As stormwater enters the unit, sediments are separated and deposited in one chamber while hydrocarbons, larger trash and litter are forced into another. The device’s unique tumbling action serves the dual purpose of transporting the materials, while at the same time continuously cleaning the internal screens, thereby preventing clogging. Servicing is recommended every 6-12 months to remove the captured contaminants and we offer a service agreement option with each Enviro E Series unit. Growing environmental awareness has led governments and legislators to set new water quality standards and promote Water Sensitive Urban Design (WSUD). One of the aims of such initiatives is to encourage the removal of pollutants and other contaminants such as hydrocarbons and sediments from stormwater. The Enviro E Series provides a fully compliant, simple, low-cost way of achieving this. In contrast to the conventional approach of multiple devices and pit inserts, the Enviro E Series centralises capture and retention of the full range of contaminants within a single unit. 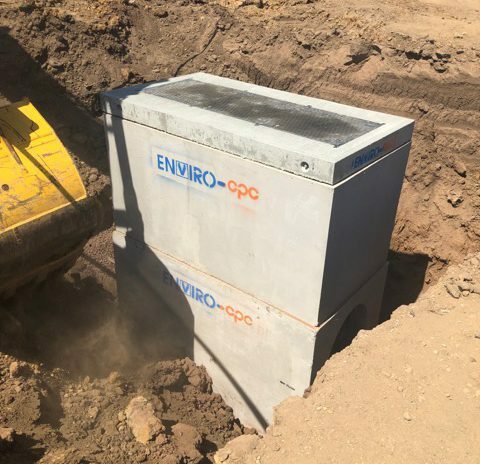 Typically one Enviro E Series unit is sufficient to service catchment areas up to 20,000 sq m.
Not only is the Enviro E Series easier and more straight forward to install, it takes up only a small footprint which means it can be conveniently positioned for ease of access and servicing. Stormwater Australia, as the national advocacy body have recently issued a draft protocol for the field testing and monitoring of devices that fall under the classification of Stormwater Quality Improvement Devices (SQID’s). 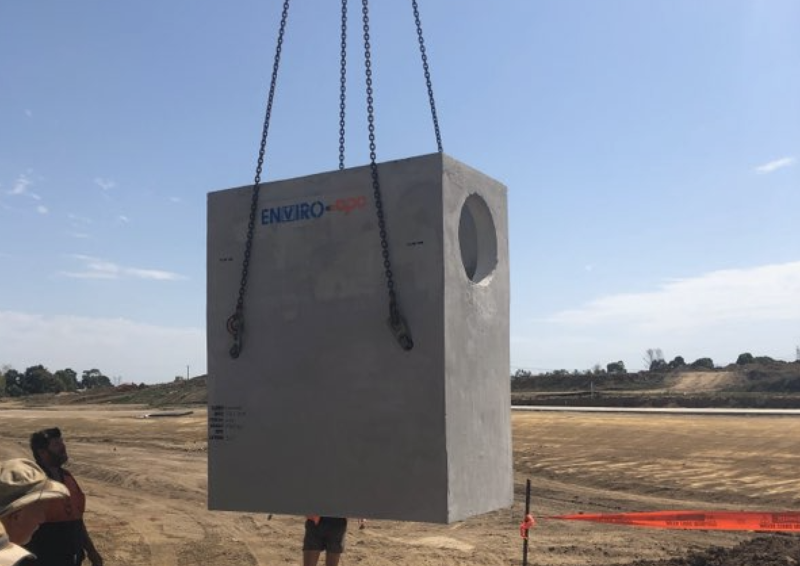 In accordance with the high standard of compliance, Enviro Australis have engaged independent industry experts to implement the draft protocol entitled Stormwater Quality Improvement Device Evaluation Protocol (SQIDEP). This is aimed at augmenting field monitoring and testing already conducted.